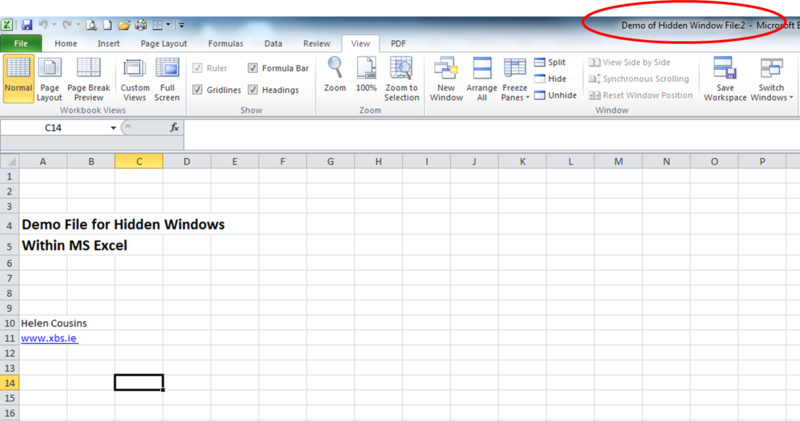 Microsoft Excel, (both 2007 and 2010 versions), allows you to work with multiple windows open within one spreadsheet file. 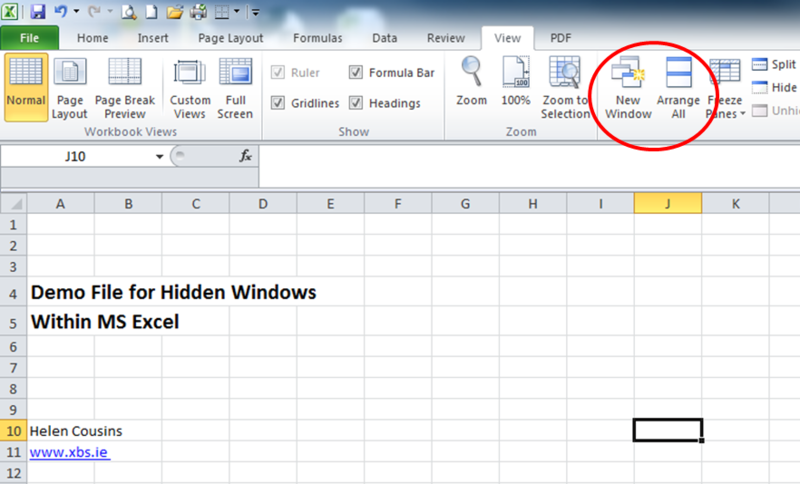 MS Excel also allows you to hide a window, which is a function that probably has very limited use. It is far too easy to accidentally hide a window, because the “hide” button is placed right beside the “split” button, which you would more commonly use to split your screen. In other words, you can hide a window, but not be aware that you have done it. The problem is that if you save a file with one or more windows accidentally hidden, you’re going to have a file that behaves very strangely indeed and gives you a lot of grief. In December 2012, we hit upon this problem, and months of work on an Excel spreadsheet were put in jeopardy as we could not update the file. We considered many possibilities to explain the strange behaviour of the file, including the possibility that we might have a virus. However, even after we had worked out that we had accidentally hidden a window, we couldn’t find instructions within “Microsoft Help” to assist us to either access or close the hidden window. We found lots of forums across the web filled with users who had similar problems. None of the answers posted looked particularly attractive to us, as they suggested doing radical things like changing the registry of the computer. The good news is that when you know what’s going on, it only takes a few keystrokes to access the hidden window and to close it. In case you, (like we were), are going loopy at midnight trying to fix this issue, I’m going to to give you the answer upfront and then a series of screenshots to show you where to find the different keys. 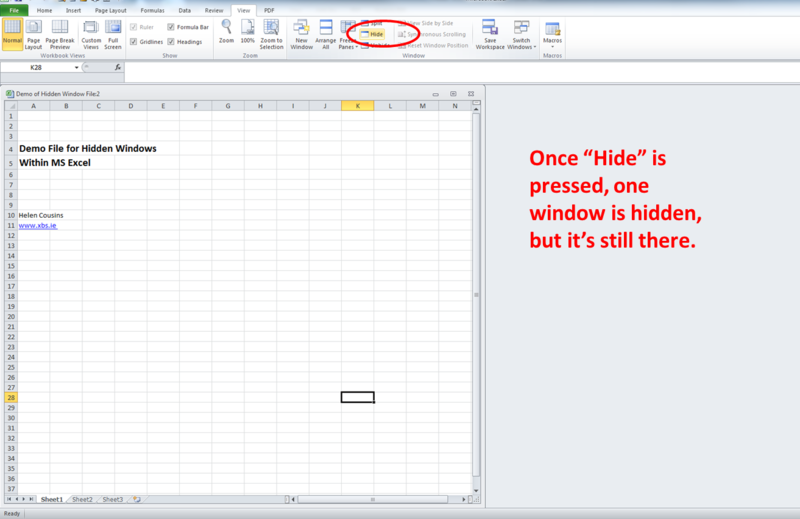 If you retrieve an Excel file with a hidden window, quite simply it won’t work. The menu ribbons along the top will have almost all of the options “greyed out“. If you start to enter data, you may find that the cells simply start to fall out of line, as if there was some sort of implosion within the sheet. It’s hard to to describe without actually replicating it, but the screenshots below will show you how to identify if you have a hidden window. The “View” ribbon offers functionality to open a new window within a spreadsheet. This is useful if you are preparing, for example, a summary sheet from other sheets within the file. If you work with multiple windows within files, you will be used to seeing a screen display similar to the screenshot below. You should note that if you have one or more windows open, that the file name will appear at the top of each window, with a colon at the end of the file name and a window number beside each window. In the screenshot below you can see that it contains two windows, these are identified, left to right, as “:2″ and “:1″ (underlined in red below). When you work with multiple windows, you may want to split your screen. Unfortunately the key for splitting your screen is directly above the “hide” button, see below. Once you hide a window, you can’t see it, but of course it’s still there. Problems arise when you save the file with the window hidden. When you open the file again and continue to work on it, you won’t be able to edit it. The way to identify if your file has more than one window open, is to look at the file name at the top of your screen. If the file name ends with a colon and a number, as in the screenshot below, then the file has more than one window open. The way to toggle between open files in MS Excel is to press “Ctlr” and “F4″ keys at the same time. If your file has a hidden window, first of all you need to toggle into that hidden window, (“Ctrl” + “F4″). Excel then looks as if you just have the program open but there is no file open. Next click into the “View” menu ribbon, and click the “Unhide” button as highlighted below. You will then be invited to select the workbook, (i.e. 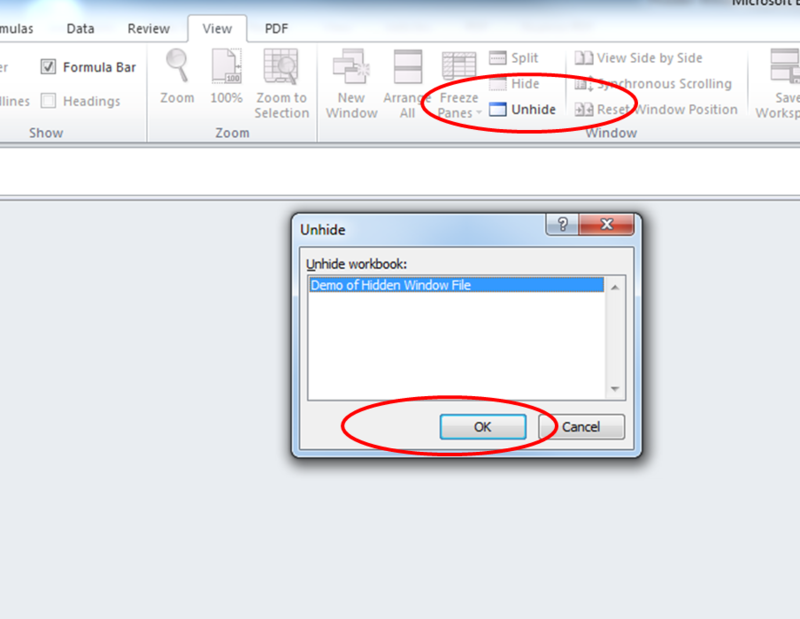 file), which has the hidden window, then click “OK”. You should now have restored your file to just being a single window file. The way to check this is to look at the name of the file at the top of your screen. If you have closed all windows, hidden or otherwise, there will no longer be a colon and window number at the end of the file name, as per the screenshot below. That’s it, you should be able to use your Excel file normally now. It takes only seconds to correct this problem when you can identify it exits. I hope this helps somebody out there, and saves a lot of the grief that we had when faced with a file that simply wouldn’t behave. Have you ever encountered this problem? If so, please let me know in the comments below!